To keep pace with the expectations of your customers, business partners, and employees in today’s digital economy, you must make decisions more rapidly and with greater confidence than in the past. Achieving this business transformation requires two things – firstly, immediate access to information that is timely, reliable, and insightful and, secondly, the ability to action the insight gained. 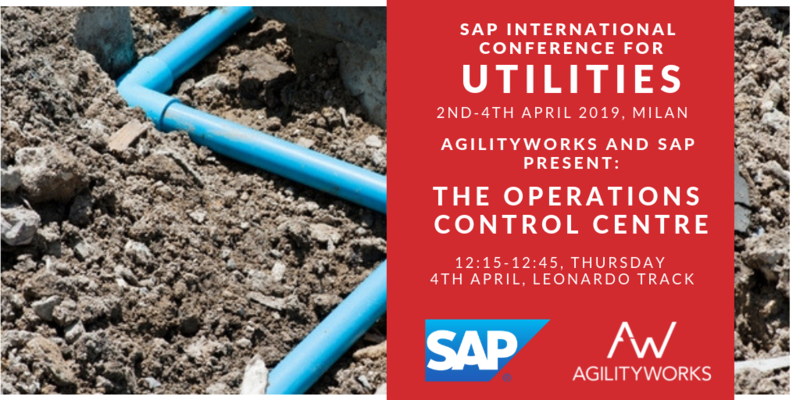 Using the scenario of a leakage in the network, this live demonstration showcases how Utilities organisations can improve their ability to respond to a major incident in a customer-centric manner and dramatically reduce the time taken by employees to resolve the issue. The solution amalgamates the use of class-leading technologies within the context of total workforce management to drive measurable outcomes. It leverages structured and unstructured data from multiple sources (both SAP and non-SAP) to provide an end to end solution which is integrated into both front end and operational business processes and solutions. The solution, developed on SAP software and using AgilityWorks accelerators, demonstrates how the liberation of data into an intelligent platform can transform how you run your business.